Boulder City High School students and faculty will hold classes in a brand-new building at the end of winter break Jan. 2. 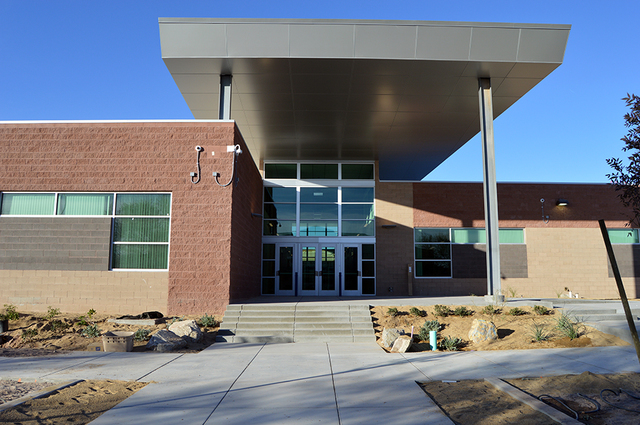 Max Lancaster/Boulder City Review Students and faculty at Boulder City High School are scheduled to move into their new offices and classrooms Jan. 2. The building features 18 classrooms, as well as two designated for drama and art. 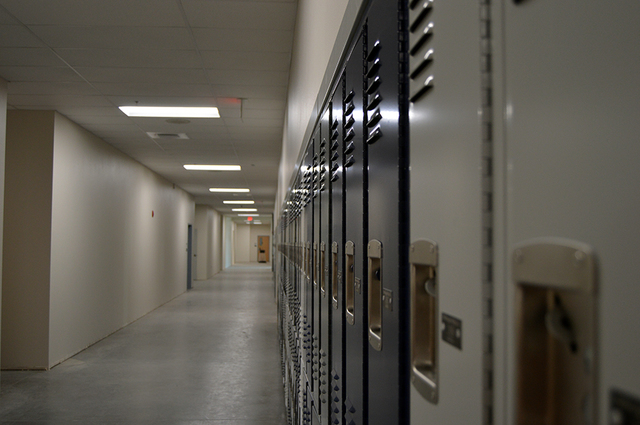 Max Lancaster/Boulder City Review Students are expected to be able to walk to class in these hallways at Boulder City High School for the first time Jan. 2. 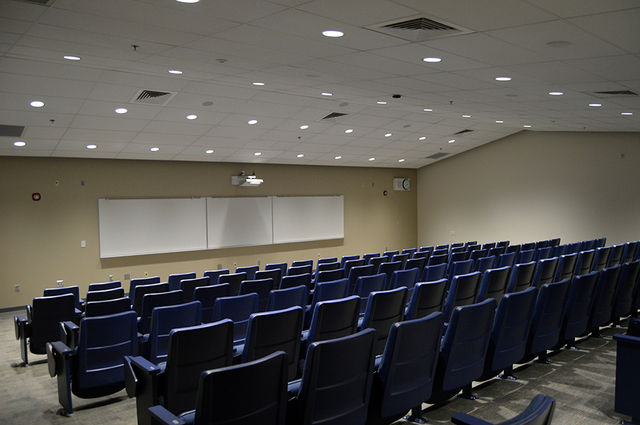 Max Lancaster/Boulder City Review A lecture hall inside the new Boulder City High School building can seat the entire freshman class, according to Principal Amy Wagner. 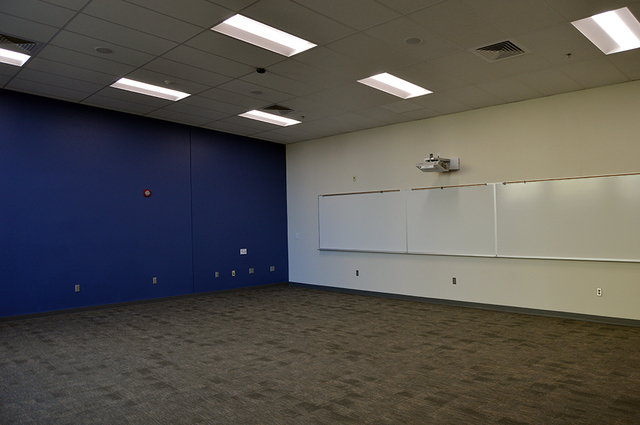 Max Lancaster/Boulder City Review This is one of 18 classrooms inside Boulder City High School’s new building; it is expected to house math classes. According to the Clark County School District, equipment such as furniture and computers will arrive Monday and be set up by Wednesday, with the teachers spending the rest of the time before January setting up their classrooms. The new building’s completion is Phase Two of a four-phase project. Phase One, completed in 2005, included the high school’s gym, while phases three and four deal with the creation of a fine arts center and athletic facilities such as a football and soccer field and new tennis courts. All students and staff will move into the new 40,000-square-foot building with the exception of science and some electives teachers. The new building has 18 regular classrooms as well as a drama and art classrooms. According to the school district, construction of the new building was given a budget of over $14 million in 2014 and was originally approved in 1997 by voters through bonds to fund a 10-year school construction plan across Clark County. Phases three and four of the project are expected to cost around $25 million and begin in late February or early March, when crews will break ground on the construction of the school’s performing art center and new athletic facilities, Wagner said. The center will feature 454 seats, a music room and a broadcast station for school television. The football stadium will feature new bathrooms, stands and a press box. Wagner said she expects the arts center to be completed by December 2017 and the football stadium to be completed by September 2018. Phase Four also will include a new soccer field and tennis courts. Wagner said parents and students have been excited about the new building. “We have been able to take some people inside for a tour, and they have given us really positive feedback,” Wagner said.